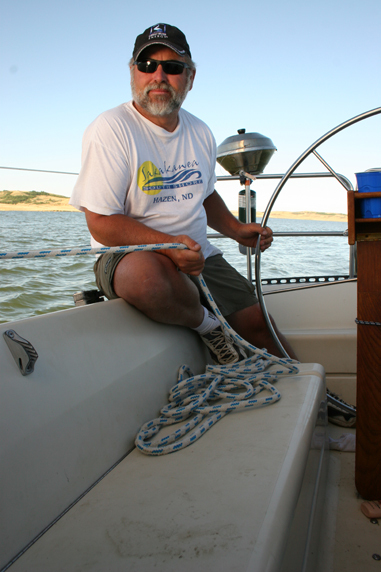 But the days before this bike trip, at the start of the long weekend we spent in North Dakota last July, I experienced a wholly different type of adventure: Sailing on Lake Sakakawea. Indeed, if the Maah Daah Hey that weekend was a bit of hell, then Sakakawea—a 368,000-acre reservoir of the Missouri River—was a big dose of heaven. I sailed with guide Mike Quinn on the 34-foot Sovereign, a white and gleaming craft with teakwood decks and a cabin to sleep five. 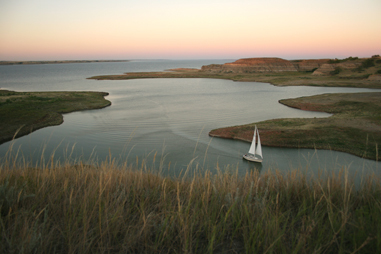 By numbers alone, Lake Sakakawea is an impressive body of water, with more than 1,200 miles of shoreline, most of it uninhabited and wild. At about 170 miles long, the winding lake heads westward through North Dakota in a massive S-curve to the Montana border. Clear water up to 180 feet deep is measured at the Garrison Dam near the lake’s eastern end. 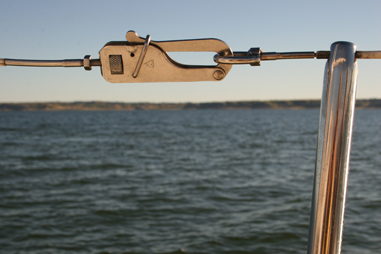 In fact, Sakakawea is among the world’s largest artificial lakes, ranking at No. 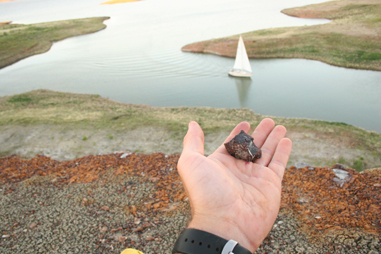 3 in size in the United States after Lake Mead and Lake Powell, the reservoirs of the Colorado River in the Desert Southwest. Our trip—which I wrote about in New York Times, http://travel.nytimes.com/2006/09/22/travel/escapes/22sail.html—included two days of doing nothing much more than pulling sheets, tying off ropes, and working the boat at Quinn’s command in an exhilarating participatory trip. We zigzagged and tacked for the day and into the evening toward the slowly sinking sun. 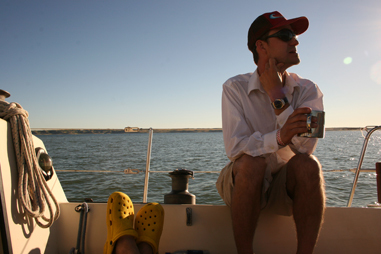 We anchored in a bay near the start of the state’s Badlands region, where Sakakawea casts its long arms into dry hills and desert canyons. We dove off the boat and swam, and we hiked into the wild hills during short breaks on land. Finally, we slept out under the stars, grilling dinner on the deck of the Sovereign before laying back to be lulled under a deep vaulted velour of unadulterated silence, of absolute North Dakota nothingness.